The GPS 400 and its larger companion, GPS 500, provide big-picture situational awareness and a host of interface capabilities. GPS 400 is a color moving map and includes the popular features of the GNS 430 — minus the nav and comm. 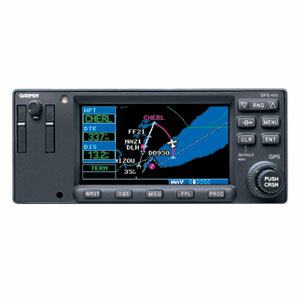 Upgrade GPS 400 with WAAS navigation capabilities to fly precision WAAS approaches. 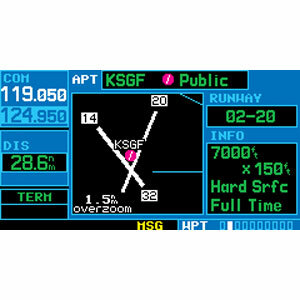 GPS 400's 4-inch high-contrast display with brilliant colors makes it easy to read and interpret pilot-critical information. Effective use of color makes it easy to see your position relative to ground features, chart data, navaids, flight plan routings, approach procedures and more. Conveniently scan information from wide viewing angles, even in direct sunlight. GPS 400 seamlessly integrates built-in terrain and navigation databases, providing a clear, concise picture of where you are and where you’re heading. The 400's huge Jeppesen® database, updated with front-loading data cards, contains location reference for all airports, VORs, NDBs, Intersections, Flight Service Stations, published approaches, SIDs/STARs, Special Use Airspace and geopolitical boundaries. A detailed basemap clearly shows airports, cities, highways, railroads, rivers, lakes, coastlines and more. Using information from the built-in terrain and U.S. obstacles databases, the 400 displays color coding to graphically alert you when proximity conflicts loom ahead. GPS 400 is one smart box that is simple to operate. Thanks to intuitive software, logical page design and efficient knob layout, this unit makes so much information easy to use. 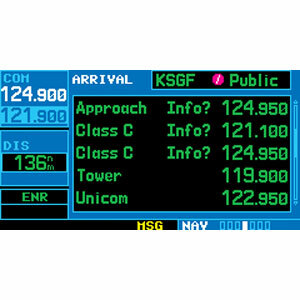 Its user-configurable display simplifies access to massive amounts of pilot-specific data. GPS 400 is easy to interface with a wide array of optional sensors and tracking systems, allowing you to see and avoid hazards such as threatening weather, lightning or air traffic. With an optional subscription to XM WX Satellite Weather™ and the addition of the GDL 69 or 69A datalink receiver, you’ll have access to high resolution weather for the U.S., right in the cockpit. Information includes NEXRAD and METARs and can be laid directly over Jeppesen and topographic map databases. With an additional monthly service fee, GDL 69A delivers XM Satellite Radio to your aircraft. Add the Garmin GTX 330 Mode S transponder, and GPS 400 will also display Traffic Information Services (TIS) alerts that identify surrounding air traffic.